These muffins are the perfect combination of tender, soft and sweet! 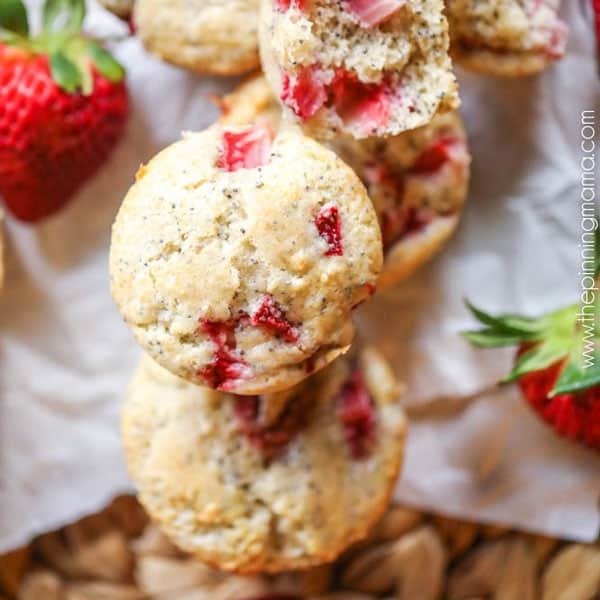 They are filled with ripe strawberries and perfectly balanced with poppy seeds to give just the tiniest hint of crunch. These will leave you wanting more, so be careful you don’t eat the whole batch! When life gives you lemons, you make lemonade. 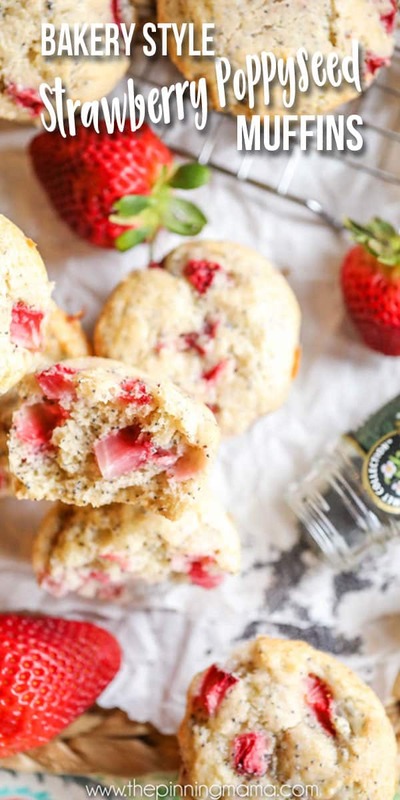 But when said lemons are only metaphor and there is nothing to make lemonade with, then you just double down and make strawberry poppy seed muffins instead. The hubs has been gone a lot and with the ages of the kids (7, 4, & not napping 2) I am just beat. I know it probably isn’t a healthy relationship with food and all, but when I get down, I love to make treats. 7 years ago now we were on a 5 week trip to Montgomery, AL for a training my husband was doing for work. We had just had our first baby only 5 weeks before and so I decided what better way to spend my maternity leave than to tag along with our new baby and a jam packed carload of all the baby gear that first time parents think they can’t function without. I didn’t know anyone in Alabama, and although I did meet a few people over the time we spent there, I spent most of the time exploring, just me and the baby. A friend of mine that had been to this same training years before us had recommended a pizza place in this really cute area of town. I ventured there one day and not only was the pizza place so delicious, but I spotted a bakery right near by. I of course had to check it out and from that point on I was absolutely addicted. They had fresh homemade crusty loaves of bread. The had huge soft muffins. They had giant mile high scones. And they gave me a punch card! I could come back and try all of these delicious creations and then I could maybe someday even get a free one! So I did of course try them all. And they were all seriously and ridiculously delicious. My favorite though was a strawberry poppy seed scone. It was tender and sweet. 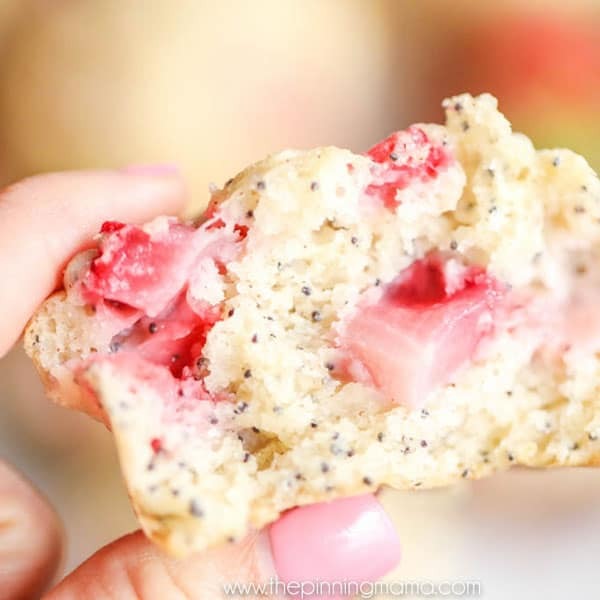 It had these soft juicy chunks of strawberry but then also these poppy seeds that gave the slightest little crunch. They were so addicting. Luckily for my waistline, they didn’t have these magical scones every day, but when they did, they usually had them in regular or whole wheat. If I wanted to splurge I got regular, but if I was feeling like I needed to watch it, I would get the whole wheat. Both were good, but the regular one stole my heart! I tried over the years to recreate this scone I loved so much, but nothing ever quite captured it like they did at Louisa’s Bakery. I did however decide one day to take my favorite muffin base and instead of doing blueberries, chocolate chips, or one of our other go to favorites, that I would add in those flavors I still dreamt of. I chopped fresh, ripe, red, juicy strawberries and mixed them in with just enough poppy seeds. They baked and I watched. They came out and it was love at first bite! Although these aren’t quite the same as the scones, they still have the same characteristics that I loved so much. The tender crumb, the slight crunch, the sweetness from the berries. This recipe comes husband and kid approved. My husband got one for a snack and then went back for two more which is my preferred sign of approval, ha! 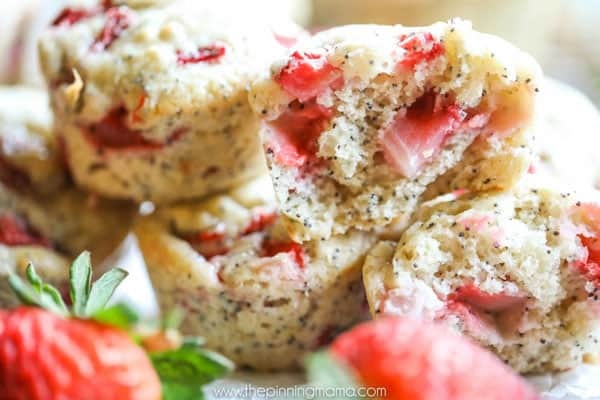 So whether you are making a summer breakfast or looking for something to serve at a brunch, baby or bridal shower these muffins are pretty much perfect and easily go from casual to more upscale. If you just want the full printable recipe, skip on down to the bottom of this post for the recipe card. If you want my tips and tricks for how I like to make this recipe, then read on here! In a mixing bowl, cream butter and sugar. Add eggs, one at a time, beating well after each addition, then add vanilla. I use my the paddle attachment on my Kitchenaid mixer for this, but you can easily do it by hand as well, as pictured. Combine the flour, baking powder, baking soda, cinnamon, poppy seeds and salt; stir into creamed mixture, alternating with sour cream until just moistened. It usually takes me about 2 to 3 additions of dry mixture and sour cream to get it all combined. Make sure not to over mix. Only mixing until the batter is just moistened is key to keeping the muffins light and airy with a tender, moist crumb. Fold in strawberries. On a Demarle Flexi pan, fill muffin cups 2/3 full. If using a standard pan, make sure to grease or line the pan with paper liners. I usually put in a whole pound, but if you think that is too many you can cut back a little. 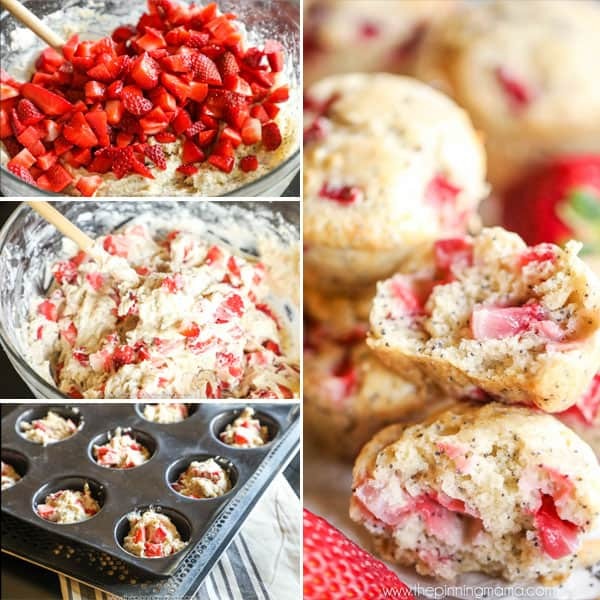 I love my muffins packed with those tender strawberry pieces. I also love my Demarle pan SO MUCH! It is amazing how evenly it cooks and allows the muffin to brown. The best part though, it NEVER sticks! This pan is not cheap, but it is the best silicone pan I have ever used and is amazing for baked goods. Bake at 400 F for 20-25 minutes or until just done in the middle. You can insert a toothpick to make sure it comes out clean. Enjoy! You can also freeze these and reheat to enjoy a homemade muffin any day, even when you are in a rush! Fold in strawberries. Fill greased or paper-lined muffin cups until two-thirds full. Bake at 400 F for 20-25 minutes or until just done in the middle.